DELTA State Governor, Senator Dr Ifeanyi Okowa has said his administration spends about N1 billion monthly on pensions. The Governor made the disclosure on Wednesday at Ogwashi-Uku during a town hall meetings with the people of Aniocha South local government area of the State. 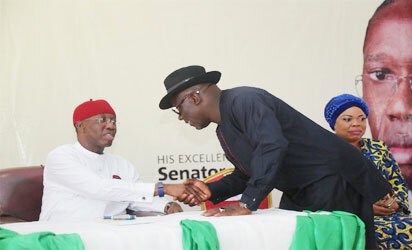 Delta State Governor, Senator Ifeanyi Okowa (left) and Speaker, State House of Assembly, Hon. Sheriff Oborevwori, during 2017 Aniocha South Town Hall Meeting, held at Ogwachi-Uku. The Governor who also, had a town hall meeting at Issele-Uku, Aniocha North local government area of the state, said his administration spends more than N300 million monthly to settle pensioners in the old pension scheme and also, spends more than that to pay pensions of retired civil servants who were on the contributory pension scheme. “I pray that our resources will improve for us to do more,” the Governor stated. At Issele-Uku, Governor Okowa who got accolades for the provision of infrastructure and empowerment programmes carried out by his administration, stated that his administration was committed to empowering the youths to be entrepreneurs through skill acquisition programmes. While noting that most of the beneficiaries of the empowerment programmes have become employers of labour and contributing to the socio-economic development of the state, the Governor stated that his administration was committed to ensuring prudent management of resources to the benefits of Deltans. Chairman of Aniocha North local government area, Hon. Chuks Oseme thanked the Governor for the giant strides his administration has recorded within the last two years assuring him of continual support by Deltans.